Thomas Bryum Hartis of Indian Trail, NC. 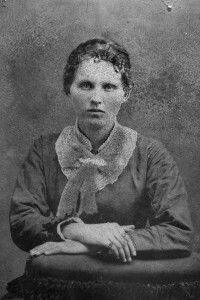 Annie Francis Porter Hartis (1892 – 1934). Thomas attended Indian Trail Presbyterian Church, and he attended Indian Trail School up to the 10th grade. He never married. 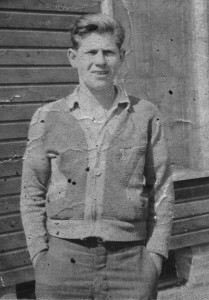 Thomas worked briefly at Lance Packing Company in Charlotte, NC, before entering the U.S. Army on March 9, 1943 during World War II. 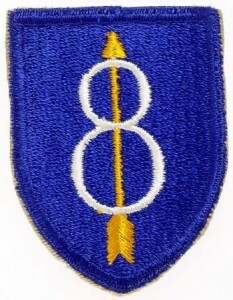 Company C, 13th Infantry Regiment, 8th Infantry Division. This division was already fighting German soldiers in northern France. Thomas was one of many soldiers transferred to the infantry to fill the depleting ranks as fighting escalated in the push eastward against the Germans. His division fought in the long and fierce Battle of Hürtgen Forest from September 19, 1944 to February 10, 1945 at the German-Belgium border. These soldiers also fought in the bloody Battle of the Bulge in Belgium from December 16, 1944 to January 25, 1945. Thomas was wounded around September 8, 1944 in France and January 24, 1945 in Germany. Thomas was killed in action April 6, 1945. 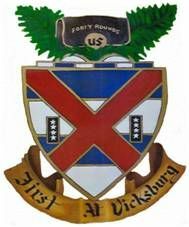 On that day, the 13th Infantry Regiment was fighting at Siegen, Germany, just east of Cologne and the Rhine River. Siegen was an important German communications center. Ironically, Siegen is only about 50 miles from the small town of Breuna, Germany, where Thomas’s great great great grandfather Ludwig Hirdes (Lewis Hartis) was born and raised. Ludwig sailed to America as a Hessian soldier in Regiment Rall in 1776 fighting for the British during the Revolutionary War. He deserted his unit at Charleston, SC, in 1782 and settled near Charlotte, NC. He was a blacksmith and farmer. On August 12, 1965 Elmer B. Elliott of Sidney, OH, drove up at the home of Tom’s brother, James, in Indian Trail, NC, and asked if Tom Hartis lived there. Mr. Elliott said that he had served in the U.S. Army with Tom during World War II, and that Tom had saved his life. After James told him that Tom did not survive the war, an upset Mr. Elliott left town without elaborating. 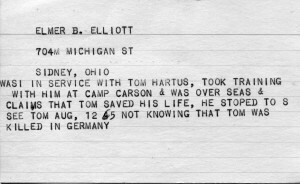 Note card typed by Tom Hartis’ brother, James, who served in the South Pacific in the U.S. Army in World War II. James Hartis also marched in the April 14, 1945 funeral of President Franklin D. Roosevelt in Washington, DC. 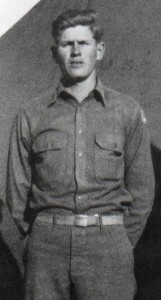 According to the U.S. National Archives and Records Administration, Elmer B. Elliott of Shelby County, OH, was born in 1918 and enlisted in the U.S. Army in 1942. Sidney is in Shelby County. According to Bud Elliott’s 1988 obituary, he and his wife, Mary (1920 – 1985), did not have children. 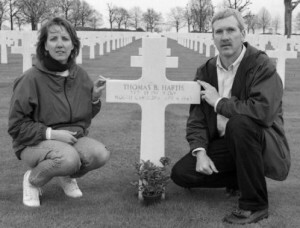 Forty years after Thomas’s death, his youngest brother, Ernest, became the first family member to visit Tom’s grave in Margraten, Netherlands. 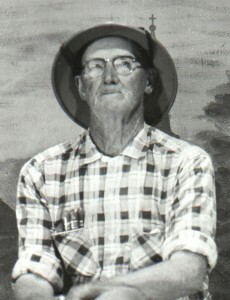 Ernest worked as Maintenance Director at Camp Thunderbird at Lake Wylie, SC, during the 1970s and 1980s. The camp is owned by the YMCA in Charlotte, NC. Ernest had talked for years about taking a trip to Europe to visit the grave. Camp friend Todd Low agreed to go with Ernest. Members of the Board of Directors at the YMCA heard about the planned trip, and they paid for Ernest’s round-trip airfare. 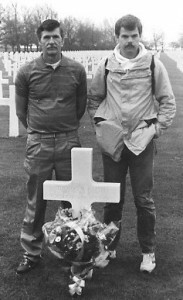 Ernest and Todd visited Europe in 1985 between April 24 and May 8, flying to and from Frankfurt, Germany. They traveled by train to Austria, Switzerland, France, Belgium, and the Netherlands. They traveled by boat down the Rhine River. “We found a flower shop (in Maastricht), and Ernest bought some flowers to put on his brother’s grave. Once all our shopping was done, we got on bus 54 to Margraten, Holland, which is about a 10 minute ride. We got off the bus in front of the cemetery. When we started walking down the driveway to the cemetery, Ernest began to be quite. As we came to the main monument, Ernest started taking a lot of pictures. We went in the visitor’s center and signed our names in the guest book. 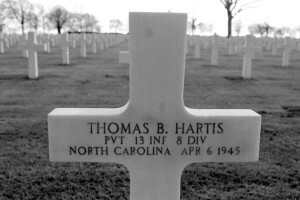 We asked where the grave of Thomas B. Hartis was and the man told us where to go. He asked Ernest if he was related, and to fill out a card. He also gave Ernest a folder of information on the cemetery. We left the information center and walked to the field of headstones in the shape of crosses, and stars for the Jewish soldiers. It was breathtaking looking at all those headstones in perfect rows as far as you could see. This was a big moment for Ernest. It has been 40 years and 29 days since his brother was killed. The man in the visitor center told us to go to Plot A, Row 7, Grave 13. We made our way over to Plot A. Ernest was shaking a little as we walked to Row 7, and I could tell that he had tears in his eyes as he found his brother’s headstone. This was it, Ernest had been waiting on this trip for over 40 years, and now he has found his brother’s grave. In 2004 Ernest’s son, Tim Hartis, and Tim’s wife, Edith, visited Germany, Austria, Netherlands, and Belgium. They flew to and from Munich, and they traveled by car from April 1 to 12. They visited Breuna and other places in Germany. They visited Tim’s Uncle Thomas B Hartis grave on April 7.